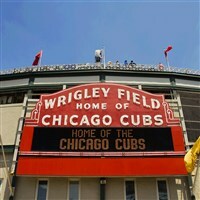 Cubs at Wrigley Field - Van Galder Tour & Travel - Several Dates Available! See the Cubs at Wrigley Field in 2019! Cubs at Wrigley Field - Choose from several dates! Dates: May 10 vs Brewers, June 8 vs Cardinals, June 27 vs Braves, July 14 vs Pirates, August 3 vs Brewers, August 22 vs Giants, August 30 vs Brewers, and September 20 vs Cardinals. Hop aboard the Van Galder coach for a fun day of baseball action to Chicago. See the 2016 World Series Champs battle it out against a line up of fantastic opponents! Stroll Wrigleyville prior to the game or grab a hot dog and take in batting practice. Let us take you out to the ole' ballgame!! TOUR INCLUSIONS: Professional tour director, transportation, and game ticket. NOTE: Coaches park off-site in Chicago near Wrigley Field. There is no access to the coach once you disembark. You will not reload until after the game. We stay for a complete game, including extra innings.